A five-way light switch provides four points of control over a single set of lights. This arrangement is commonly used on long hallways or stairwells to allow someone to operate the lights from various points. It creates a safer home by assuring proper illumination to reduce running into furniture or objects in the dark. 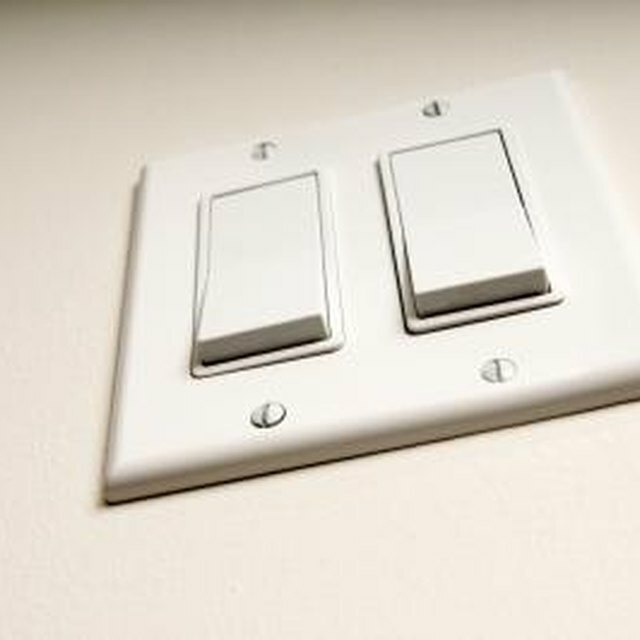 A five-way light switch can also be modified for any number of switches by adding additional switches in the center of the wiring. Wiring a five-way light switch allows for four different locations to control a set of lights. Turn off the power for the circuit you are working on at the electrical distribution panel. Confirm the power is off by touching a non-contact voltage detector to the wire's insulation. Loosen the grounding screw in all four of the switch's electrical boxes with a screwdriver. Strip 3/8 inches of insulation off the black, white and green or bare wires coming from the electrical panel. Wrap the green or bare wire around the first electrical box's grounding screw and tighten it down. Loosen the terminals on the 4-way light switch. Wrap the black wire coming from the electrical panel around the bottom right terminal and tighten it down. Strip 3/8 inches of insulation off the three wires in a new section of 14/3 gauge wire. Twist the white wire from the electrical panel with the white wire from the 14/3 gauge wire with pliers and install a twist-on wire connector on top. Wrap the black wire from the 14/3 gauge wire around the switch's top left terminal and tighten it down. Wrap the red wire from the 14/3 wire around the top right terminal and tighten it down. Run the 14/3 gauge wire to the next switch in the series. Cut the wire to length and strip the three conductors. Loosen the terminals on the switch. Wrap the green or bare wires around the electrical box's grounding screw and tighten it down. Wrap the black wire around the top left terminal on the switch and tighten it down. Wrap the red wire around the top right terminal and tighten it down. Strip 3/8 inches of insulation off a new section of wire. Wrap the black wire around the bottom right terminal of the switch and tighten it down. Wrap the red wire around the bottom left terminal and tighten it down. Twist together the two white wires with pliers and install a twist-on wire connector on top. Wrap the green wire around the electrical box's grounding screw and tighten it down. Run the wire to the next switch and wire it exactly the same as the last switch. Run the next section of wire to the last switch and connect the top to terminals in the same way as the last switch. Cut a new section of 14/2 gauge wire and strip the conductors. Wrap the black wire around the last switch's bottom right terminal and tighten it down. Twist together the two white wires and install a twist-on wire connector on top. Run the 14/2 gauge wire to the lights and make the necessary connections. Working around electricity is inherently dangerous because we can't see it and it can kill you. Only work on wires that have the power turned off at the panel.